Out of the 52 Undergraduate Association’s goals published in The Tech last term, 19 have reached completion by the end of Independent Activities Period, while 23 have missed their deadlines. The UA Goals Checklist, a list of goals which students could use to track the progress of UA projects, served as the centerpiece of the election platform for Pius A. Uzamere II ’04 and Jacob W. Faber ’04 during the presidential elections last March. In October, The Tech ran the first edition of the checklist followed by two more updates in November. Several UA officials, including Uzamere, said they have been disappointed in the low amounts of feedback received from students as a result of the checklist. Uzamere points to infrequent updates of the checklist web site and “marketing issues” as possible causes for low student input. Nonetheless, the list seems to have provided a degree of motivation and accountability for the UA and has received significant support from current officers. Still, Uzamere said that while there has been some useful feedback from the student body, that amount has been small. While 19 of the goals have been completed as of Feb. 1, 23 goals have missed the original deadlines published in The Tech. Meanwhile, 10 goals have deadlines coming this spring. Uzamere said the projected completion dates are when MIT students can see the results of the UA’s work around campus. Uzamere added, however, that deadlines are not absolute, and that sometimes factors outside the control of student representatives can affect the completion date. Last fall, the UA established a Daytime Shuttle to transport students across campus and into Boston. There has been debate lately among the UA, Parking and Transportation, and the Graduate Student Council over routes for the winter shuttle schedule. Three routes, two from the UA and one from the GSC, are being considered, said Katherine H. Allen ’05, UA representative of off-campus students. One route shortens the walking distance for residents of Epsilon Theta and Zeta Beta Tau, another increases stops at Simmons Hall, and the third brings the shuttle route to Sidney-Pacific graduate dormitories. Allen said the recent shooting incident around Sidney-Pacific may affect the outcome of the shuttle debate. The UA Q&A, published weekly in The Tech, has been carried out by Rose Grabowski ’05, UA Senate Vice-Chair, and Harel Williams ’05, UA Committee on Student Life Chair. It began to run Aug. 24, 2003. Another goal that has reached completion is the rescheduling of Interphase. Previously, Interphase overlapped with the first days of Freshman Pre-Orientation Programs. However, now Interphase students will be able to participate in FPOPs. Of the 33 remaining UA goals, the 23 that remain in progress after the projected completion date represent the more challenging UA projects. Plasma screens displaying information and advertisements will soon line the Infinite corridor, the walls of Lobby 7, and possibly the student center, said UA Senate speaker Ling Wong ’04. The idea, which was proposed as a UA goal in October, is likely to become a reality after the iCampus project agreed to front $30,000 to fund the project. However, students may not see the screens for a while, far after the proposed UA deadline of January 2004. TV screens mounted in the student center will display CNN and other campus news information. Wong said that this will help to keep students in touch with what’s happening in the world outside of MIT. Allen is also working on a project that will establish communication and provide services for off-campus and Senior Segue undergraduates. Allen wants to create a for-reservation kitchen space for off-campus students and student groups. She hopes that spaces in Walker, once occupied by Sodexho dining, will be renovated into a student kitchen. Allen said that financial issues are curbing the project’s progress. While renovations may be possible with UA funds, continuing upkeep of the space will need separate funding, possibly by the Campus Activities Complex, Allen said. She added that the UA is working to establish and upgrade lounge and dance spaces in Walker. In addition, Allen is compiling a record of students who live off-campus. She hopes that with this list, she can keep in touch with her constituents and better represent their needs in UA discussions. The Star Market survey, which gauged student interest in Tech Cash support at Star Market, “is completed and the results are compiled,” Cummings said. He hopes to submit the report and proposal to Star Market soon, so that they can review it. A “couple of restaurants,” such as Polcari’s, have been added to the list of places that accept Tech Cash, Cummings reported on the Tech Cash expansion goal. He added that “with the dining board, we have a system set up that additional restaurants can be added.” However, Cummings thought that “the new restaurants haven’t been marketed very well” and hopes to accomplish this for the future. Pan-Hellenic Senator Robin Davis is working on a project that will supply dormitories, fraternities, sororities, and independent living groups with signs listing emergency telephone numbers. The signs will be posted on the back of bathroom doors. Davis hopes that the signs will give students a “flowchart” procedure to follow in the case of an emergency. She said she hopes this will help students who are intoxicated or scared to always know where to find emergency information when it is needed. Davis has brought up the idea with the UA, and hopes to discuss further plans with Dormitory Council representatives and house managers. While the signs will not be required by MIT, dormitory governments will be suggested to post them in their facilities. “We’re not trying to shove anything down anyone’s throat,” Davis said. She hopes the signs will go up before Orientation next year. The UA Student Committee on Education Policy (SCEP) has been primarily working on projects evaluating the accuracy of credit designations for classes and the recent end of pass/no record for freshmen second term. These are expected to be finished in the middle of the term, said Michelle Nyein ’04, co-chair of SCEP. Nyein said they will distribute surveys and conduct focus groups for undergraduates in order to understand how grades, extracurriculars, and other aspects of life were affected by ending pass/no record. 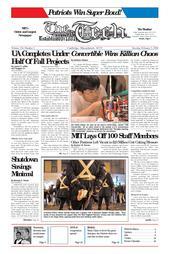 MIT would not release any official information about that, she said. SCEP will then give a written report. SCEP will also study course evaluations to determine whether the units assigned to classes are close to actual worth. Many goals have made little progress throughout the year. The UA was unable to establish a Boston Globe contact, Uzamere said. “Operation Bike Racks,” which would increase the number of bicycle racks near popular campus areas, is not projected to be completed any time soon. Athena clusters have not been set up in fraternity houses, and sports medicine support for sports clubs have not been improved. The administrative contact list for students reported progress in the last checklist. However, it has not yet been made available to the public. Other goals, such as enhancing the role of the Public Relations Committee or enhancing the role of the Nominations Committee, have yet to set goals that will visibly affect the undergraduate population. “I think people do read it,” Davis said. She added that the list in The Tech gives students a list of contacts about specific projects. “It’s representative of individual groups’ and peoples’ projects,” Davis said. “It seems like people certainly are reading,” Allen said. “But not many people are talking to the UA about what they think. It’s much more of a one-way channel which is unfortunate.” Allen said she didn’t know how the UA could work to create more student feedback. Inhan Kang ’05 said he sometimes looked at it. “I think it’s better having it there than not,” he said. Cummings said that his goals for next semester will “likely be a continuation of goals from last year.” He thought that the UA goals checked helps “get you focused” and “holds you more accountable.” “For the people who do care, it’s definitely a plus,” he said. Next House Senator Paul Montgomery ’07, completed his goal of improving the Next House Card System and now wants to “work with library systems so students can have access to the Harvard library.” He expects to complete this by the end of spring. Williams said that he has been working on an online database where “each UA member will be able to submit projects and updates” in addition to printing the goals checklist in The Tech. It would be “easier for students to find what they’re looking for,” he said, as well as more efficient for the UA, which collected goals by e-mail in the past. The Web site might even have an automated way of asking for updates by sending e-mails to UA members. Williams said that “hopefully the site will go live in mid-February.” The UA is currently in the process of purchasing a server.